“Muliebrity” is coordinate term to “virility,” referring to qualities of femininity. Southwestern College staff, faculty, and students were invited to explore how they connect with and empower the feminine aspects of the self, community, or greater collective via artistic processes. The Wild Heart Gallery is proud to present a series of artist statements from this exhibition, which runs until January 2017. I create my work from childhood experiences or memories. I try to recreate a toy in my idea, from different time eras and observe what was going on in Native American history at the time the toy was invented. My work invites the audience to remember their own childhood memories while also displaying a different feeling from historical events in Native American history. I want my audience to have a different perspective when they are thinking of their childhood memory that the toy invokes, but also recognizing that something much bigger was happening somewhere else. I want to create awareness and promote healing for the many historical traumas we as humans can carry. I am dazzled by all kinds of toys that I see. I begin looking up the popularity of a toy from it’s era and I get curious in it’s history. I think toys are an important piece of a child’s upbringing, they mark milestones in a child’s timeline of growth. Toys bring up memories that can remind one of all kinds of emotions that we as humans may or may not want to revisit. As an art therapist, it means reconnecting to our childhood and remembering how to play and inviting our inner child to play again. I was inspired by a Cherokee couple, Richard and Berdina Crowe, who made wooden Cherokee dolls that had working body parts. It fascinated me. 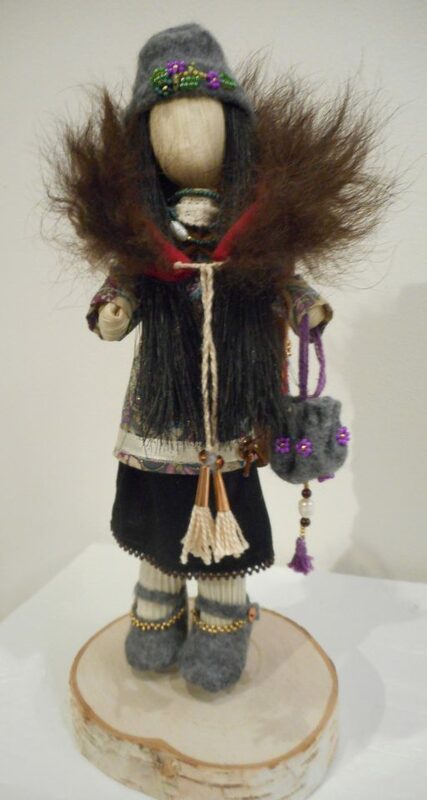 It was 2006 when I decided to create my first cloth Cherokee dolls. The toys I create are made from various materials. I like to use clay because it represents the fragile state of childhood. Some of my work is made from cloth fabrics, leather, metals and natural materials.